Phoenix Yard Books has done justice to the designs in this book by printing them in a large format, almost 12 x 12 inches. Even on large pages, many of the designs are extremely complex. In a smaller format, they would have been almost impossible to color! Based on the imprint, this is actually an English reprint of a Dutch book that was originally published in 2014 by BBNC Publishers. There is no information on the artists, but I would guess, based on the designs, that there are at least 3 separate artists represented, if not more. The designs range from simple to complex, although the majority of the designs fall in the intermediate to advanced range. So if you’re looking for a book with lots of large spaces to color, this would not be the book I’d recommend. 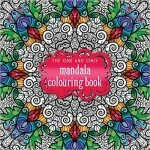 If, however, you like to lose yourself in the intricacies of a beautiful and complex mandala, you’ll love these designs. This colouring book has extra thick paper, making it suitable for all materials, whether you opt for pencil, pen or paint. However, I did a quick test on the first page, and my alcohol markers did show through on the back of the page. So if you like your Spectrum Noir markers, Copics, or Sharpies, you’ll want to make copies of the images before coloring them, because the designs are printed on both sides of the pages. My water-based markers (Stabilo 88s and Staedtler Triplus,) however, didn’t bleed through, even after saturating the area several times to get full coverage. So pencils or water-based markers would be my recommended media, if you don’t want to make copies of the page. I know that some people also have a preference regarding the thickness of the lines used to draw the shapes when creating designs to color. The designs here are pretty evenly divided between mandalas with extremely thin outlines, to designs that seem almost overwhelming with the amount of black on the page. You can glance through the book using the “Inside Look” feature on Amazon (and use the Surprise Me link) to get a feel for all the different line thicknesses.